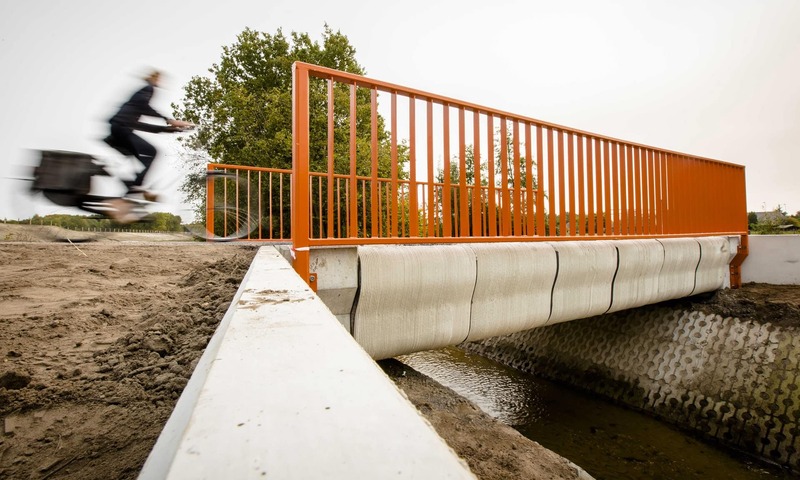 The world’s first 3D printed bridge was opened for public use in Amsterdam, Netherlands. The work on the bridge began in June 2017 and was completed only in September, i.e., after three months of continuous printing layers of concrete. The first-of-its-kind bridge is made up of 800 layers of reinforced, pre-stressed concrete. The bridge spans only a meagre 26 feet and crosses a ditch to connect two roads. Although this bridge is primarily for cyclists, it is tested for safety and is touted to sustain the load of 40 trucks. The fact that the bridge is completely built using 3D printers makes it truly unique. The bridge is constructed by BAM Infra Construction Company. “We are looking to the future, searching for a newer, smarter approach to addressing infrastructure issues and making a significant contribution to improving the mobility and sustainability of our society”, said Marinus Schimmel, head of BAM Infra. Marinus Schimmel also added that 3D printing lowered the material wastage in comparison with the traditional methods, so indirectly less scare resources were required. The advantage of 3D printers is understood from the fact that it uses much less concrete than the conventional technique as it deposits the concrete only where it is needed and in appropriate quantities. Though this is the first bridge to be opened to public, technically, it is not the first 3D printed bridge to be constructed. Another Dutch company MX3D, has already started printing a stainless steel bridge of which a third part is already completed. This concept originated in June 2015 and the printing started in October. The printing is estimated to complete in March 2018 and will be opened for public in June 2018.